Sylver Dollar and The Golden Shot shared the lead with scores of 221 after the first day of Open competition at the Jerry’s Chevrolet NCHA Futurity, presented by Great American Insurance in Fort Worth, Texas on November 17. Clay Johnson and Sylver Dollar hit the mark in the fourth set, while James Payne and The Golden Shot followed up in the sixth set as 101 contestants faced the judges. Sheza Surefire Kitty, ridden by Steve Oehlhof and Rose Colored Rey, ridden by Beau Galyean, both had the day’s next highest score, a 219. Johnson, a Hall of Fame Rider who won the 2013 NCHA Futurity on Dual Smart Kitty, rode Sylver Dollar for Lone Oak Performance Horses. The red roan stallion was bred by Linda Holmes by Metallic Cat out of Reymember Me, a Dual Rey mare that was a Non-Pro Futurity finalist with Holmes in 2008. Reymember Me’s first and second dams, Nurse Elaine and High Brows Nurse, both carried Holmes to reserve championships in the Non-Pro NCHA Futurity. High Brows Nurse is a half-sister to $31 million sire Dual Rey. Johnson, who also won the 2012 NCHA Super Stakes on KR Isadora Dual, has career earnings of $871,000. The Golden Shot, ridden by Hall of Famer James Payne, is owned by Kathleen Moore. Payne and his wife, Nadine, bred the palomino mare by WR This Cats Smart out of Velvets Best Shot. Payne won the 2009 Chisholm Trail Classic on Velvets Best Shot. The mare’s first money earner is Velvets Revolver, a full brother to The Golden Shot, which Nadine Payne rode to win the Non-Pro Super Stakes last spring. Velvets Revolver has won more than $158,000 in Open and Non-Pro competition. 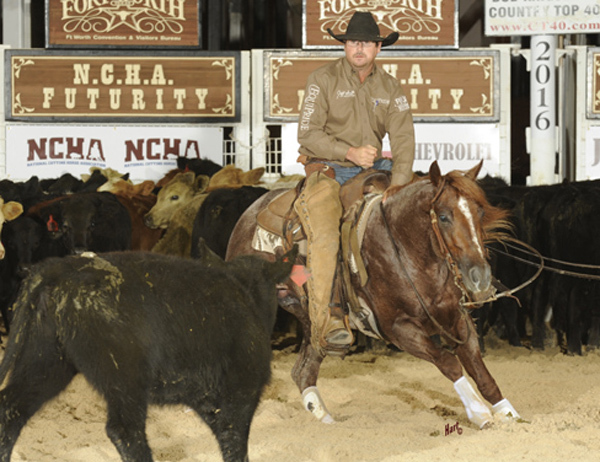 Payne is a two-time NCHA Classic Challenge champion with career earnings of $2.3 million. His first Classic Challenge win was with Sarenadual in 2012. The Golden Shot’s owner, Kathleen Moore, had won the Amateur NCHA Derby with Sarenadual two years earlier. Payne is a three-time NCHA Futurity finalist.